This is my second and extremely tardy Chieftain’s Chatter. Several hectic and event filled months have passed since I last put pen to paper. The Annual Highland Games took place in May and as current Chieftain it was my pleasure to officially open the games as well as riding (OK! just pillion) my first ‘Harley’ motorcycle into the bargain, as part of the Opening Cavalcade. The games were a huge success (even if I say so myself) and we go from strength to strength every year with more and more pipe bands competing, plus gate numbers increasing more than the year previously. My personal ‘Thanks’ to the KLHG Committee for working so very hard, to make the whole weekend a success. Our Friday Night Concert prior to the Games (Big Vern & The Shootas all the way from Glasgow) was a blast and the band were very generous with their time on Sunday also, keeping the public well entertained with numerous well known rock and pop numbers to which most of the ‘older generation’ in attendance, knew every lyric. That includes me, if you want to date the music more accurately! 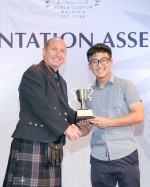 I was delighted to be asked to present this year’s “Humanities Award” (Sponsored by the Selangor St. Andrew’s Society) at the Alice Smith School annual prize giving. The winner of this year’s St Andrew’s Society Humanities Award was Clement of Year 13. Our heartfelt congratulations to him and our thanks to the Alice Smith School for continuing to include the Trustee Governors and entrusting us with the task of presenting these annual awards at the school’s prize giving ceremony. On a personal journey, I returned to Scotland for most of September this year to celebrate and take part in a couple of reunions that dated me. It also made me realise how brief our time is on this earth and how quickly it passes before our very eyes. I went back to school for my 30-year anniversary reunion, coming face to face with classmates I hadn’t seen for three decades. Preceded the weekend before by a 25-year anniversary reunion of my University MSc Class. Much grey hair, wrinkles and laughter accompanied both occasions, I am happy to report. 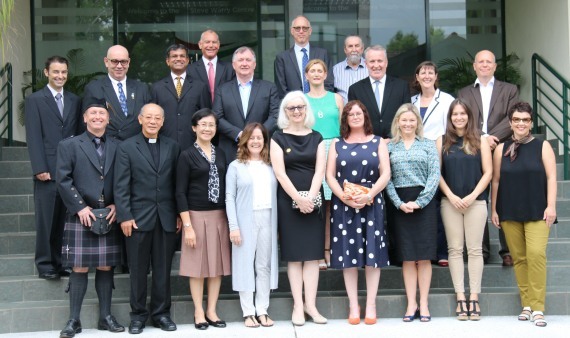 Trustee Governors of Alice Smith School and representatives of Trustee organisations. This month, it was my absolute pleasure to be asked to attend and help celebrate 60 years of trade between Malaysia and the UK, culminating in a Friday night Royal Gala Dinner, as part of a visit to Malaysia, by HRH Prince Charles and the Duchesse of Cornwall. Representing the society at this gala event was certainly one of the perks of the job and a ‘royal’ footnote in my journal. On a more solemn occasion, it was with great pride that I laid the Society’s Commemorative Poppy Wreath, at the National Monument to the Fallen, last Sunday morning. The monument is located just off Jalan Parlimen, and it was a poignant ceremony whereby we remember those who sacrificed their lives for our future freedoms. 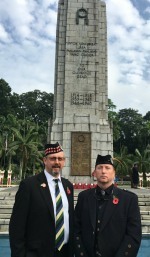 My thanks to our Vice Chieftain Jamie Graham for accompanying me and thanks also go to the British High Commissioner Vicki Treadell for a hearty breakfast reception at the residence after the service at Tugu Negara. As the days of the year 2017 quickly run out, I was very impressed with the level of support the ladies of the ABWM had at their Christmas Bazar in the Renaissance Hotel last weekend. I hope the various charities benefitted well from all the activity. The layout of the room made me feel quite festive, so it did… Must be about time to dig out the Christmas tree and get ‘Slade’ and ‘Bing Crosby’ on the turn table…(read Walkman/ipod/ipad/iphone here, depending on your generation). Still feels like I just put the tree and decorations away! Is it just me, or do the years go by faster as we get older? But before I go hunting in the cupboard under the stairs, there is time for one more celebration in the ‘Society Calendar’ and if you don’t have your tickets yet, there is still a couple weeks to go, to secure your seats/tables for our annual St. Andrew’s Ball. This year, it will be held on the 2nd of December at the Hilton Double Tree Hotel. Tickets available through Linda Ross as per the society web site. Our Ceilidh Band has been flown in specifically from Scotland, for your evening’s entertainment and we will once again be encouraged up to dance to the sounds of “Clappy Doo”. The menu has been carefully selected for your dinning pleasure and the wines are free-flow, until we run out. I look forward to meeting and greeting as many of you there, as possible. 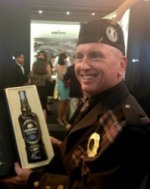 Chieftain – Selangor St Andrew’s Society.